One of the early decluttering missions of each year is to declutter your kitchen table, and then get in the habit of keeping it that way. This mission is designed to be done, at least initially, as we work through the Kitchen Organization Challenge here on the site, which is the first of the 52 Week Organized Home Challenges. I say the initial time you do it will be as part of that week's challenge, but this is the type of mission that will need to be done, daily. The first time you do it, it may take more than 15 minutes, because it's possible that a lot of clutter has accumulated onto this surface. However, I guarantee as it becomes a habit, and is done consistently, it will take far less than 15 minutes each time it's done! And once your table is consistently cleared off, I guarantee that this will go a long way toward making your whole kitchen feel more organized and pleasant to be in. If you're like most people LOTS of stuff happens at your kitchen table, not just eating. There is homework, bill paying, chatting with a cup of coffee, etc. 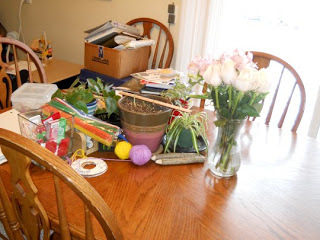 But you can't do these things (at least easily) when you've got clutter and junk piled high on the table. You have to move things to the side to eat, or stick your elbow in crumbs as you write something, or can't find the salt and pepper shakers amongst all the paper piles. Every home is different, but here are some of the most common types of items you should clear from your kitchen table daily. How Often Should You Clear The Kitchen Table? 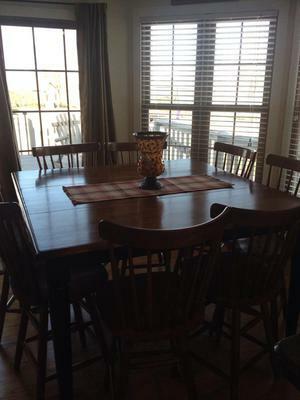 Ideally, your table should be generally free of clutter at least at one point of the day, daily. If you do deal with the clutter on the table on a daily basis there will not be time for it to accumulate and become overwhelming. Therefore, although the first time you clear off the table may take longer, if you do it at least daily it really will begin to be a quick task. I actually find it best to clear off the table after each meal (obviously), and then again as part of my end of the day routine when I'm cleaning up the kitchen for the evening. 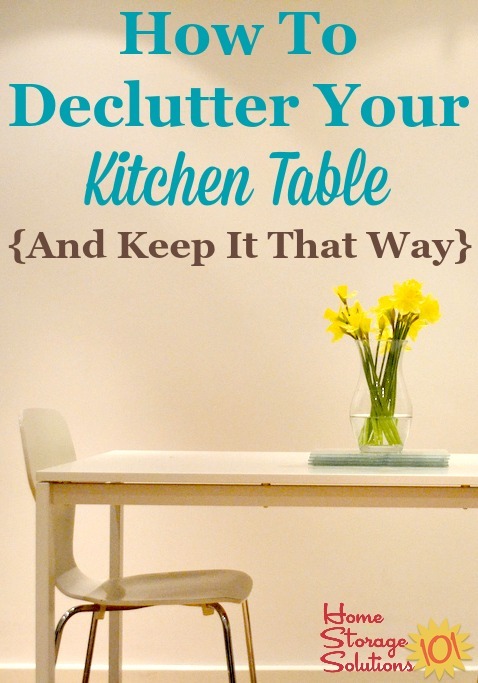 You can clear off the table as part of your daily tidy up routine. Find out more about this vital routine, that helps you maintain clear flat surfaces and keep things from getting re-cluttered at the link. While you should clear off most of the table daily, that doesn't mean the table needs to be completely bare. By all means put a pretty vase of flowers, a bowl of fruit, etc. on the table and keep it there. Just make sure those types of decorative items don't take up so much room other functions cannot occur. Further, things like placemats, salt and pepper shakers, a napkin holder, etc. also may have permanent residence on a still decluttered table. In fact, some people purposefully add decorative, but still functional items to their table, such as placemats, to keep themselves from re-accumulating clutter since the surface isn't empty. It's up to your personality to know if that will work for you, or not. Clearing your table of clutter one day of the year is great, but it won't make a permanent impact in your kitchen unless you do it daily. I've already shared that I try to clear off my kitchen each evening, before bed. Do it whenever you need to that makes sense for you, but making it a habit is so very important! Below I've gathered pictures from readers who've done this decluttering mission, including several before and after photos. 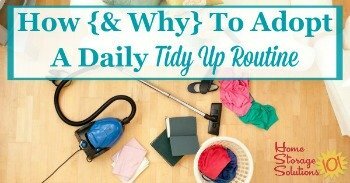 I encourage each of you to join the daily decluttering missions here, and do one 15 minute mission each day to get your home clutter free slowly, and consistently, throughout the year. Thanks to Bry from Team Collard who shared her cleared off table picture. In addition, below is a photo sent in by another reader, Ellie. Ellie said, "I finally did it!!! The mail and catalogs were the reason my kitchen table was unusable. But I FINALLY did it!!! Two projects in one!" I suggest for all paper clutter, that along with checking out the Paper Organization Series listed above, that you declutter, shred, or file your paper piles 15 minutes at a time. It's a frequent mission as we deal with paper clutter during the Declutter 365 missions. Here's the article about decluttering paper piles 15 minutes at a time. Jan from The Crafty Mermaid's Grotto shared her after picture. 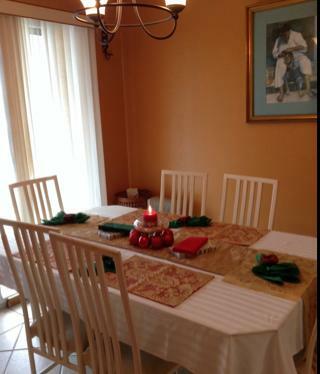 It looks great with the tablecloth and placemats already added, ready for the family to eat together. 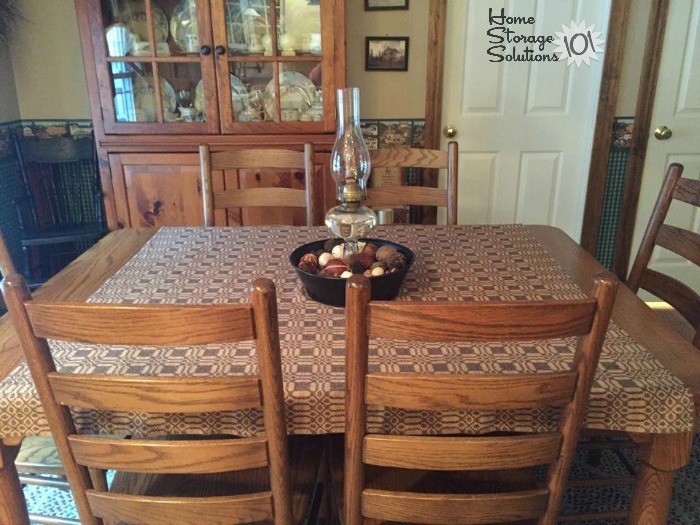 Here's another set of before and after photos, these ones from a reader, Tracey, who also added placemats to her recently cleared off table. 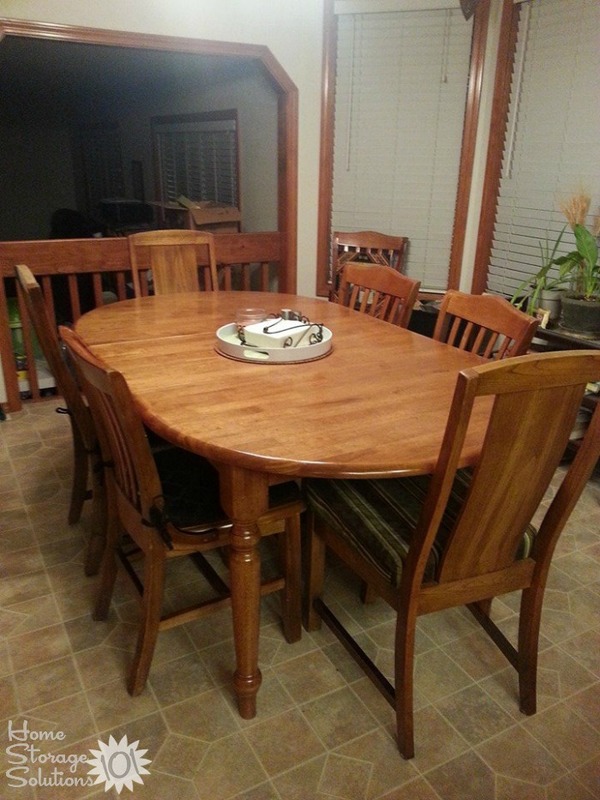 Tracey said of the before photo, "Our table is a catch all. Right now craft supplies from a school project, mail, junk, boxes of Christmas stuff..... It'll take me a lot more than 15 minutes!! Lol maybe I'll have an after picture later today! Wish me luck!" She must have had some luck, or really some persistence, because she did send in the after photo later that day, and said, "OMG!!!! I did it! Finished before the kids got home! I feel VERY accomplished!!" My Table's Clear Because I Pile My Junk Somewhere Else! 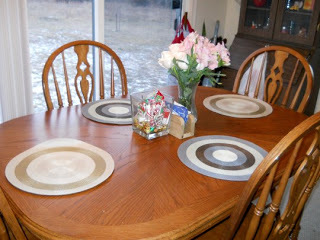 Heather sent in this photo, and said, "My kitchen table is good but my bar catches all!" That's a really common issue Heather. A similar issue is shifting items off of one flat surface to clear it, but then just moving them elsewhere, without really putting them away. This can feel really frustrating for people when doing these missions, and I hear you! Ideally, as you remove things from your kitchen table, or island or bar area, or wherever you've got your catch all space, you should be getting rid of things, donating, recycling, or putting them away elsewhere. However, depending on how cluttered your kitchen or the rest of your house is, there may not be room right now for you to properly store these items elsewhere. If you encounter this problem, don't despair! Instead, know the answer to the problem is that you're going to have to do a couple of layers of decluttering in your kitchen, over many days. 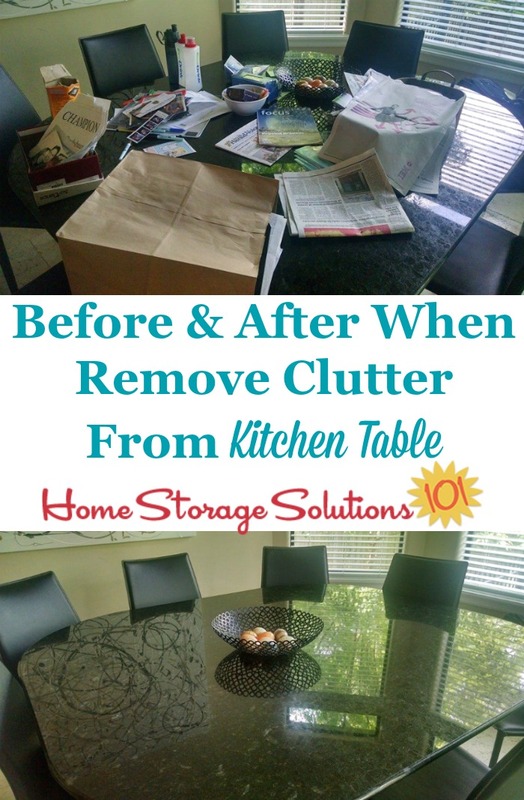 Each day you declutter a new area of the kitchen, or your home, you'll be removing items from your home and slowly, but surely, that will free up more storage space and places for you to put these items. You will also find though, when you deal with catch all types of spaces, that with time what once was important enough to lay down on the table, for example, is now old enough that it's just trash. So the first thing to do is look for such obvious wins, like trash, items that go in another space, or duplicates of things where you can get rid of at least some of them, to begin the process of clearing these surfaces! It will happen, I promise, it just doesn't happen overnight! Here's another set of before and after photos from a reader, Jennifer, who found that just a few minutes of work that she was dreading, really did pay off. Jennifer said, "Thank you for the kick in the pants to get something done in 18 minutes that I kept dreading to do for weeks!" 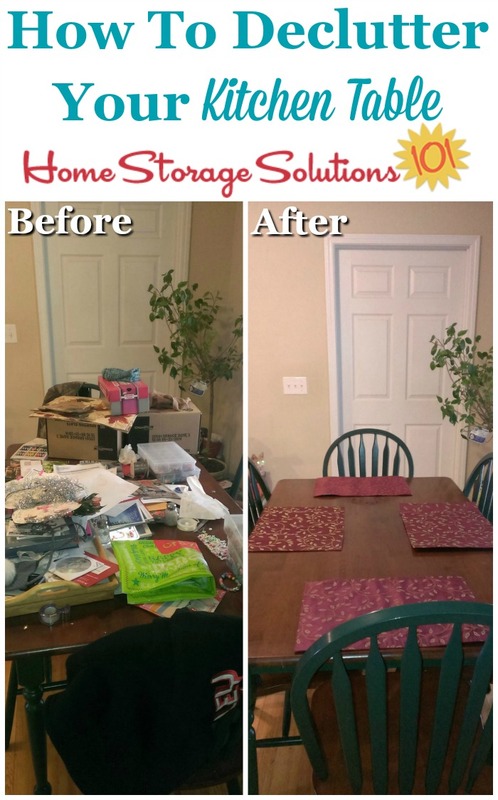 Instead of just shifting things from one place to the next, try to deal with just a few of those things each day, finding them a storage spot in your home, or getting rid of a few of them, and it will soon improve! 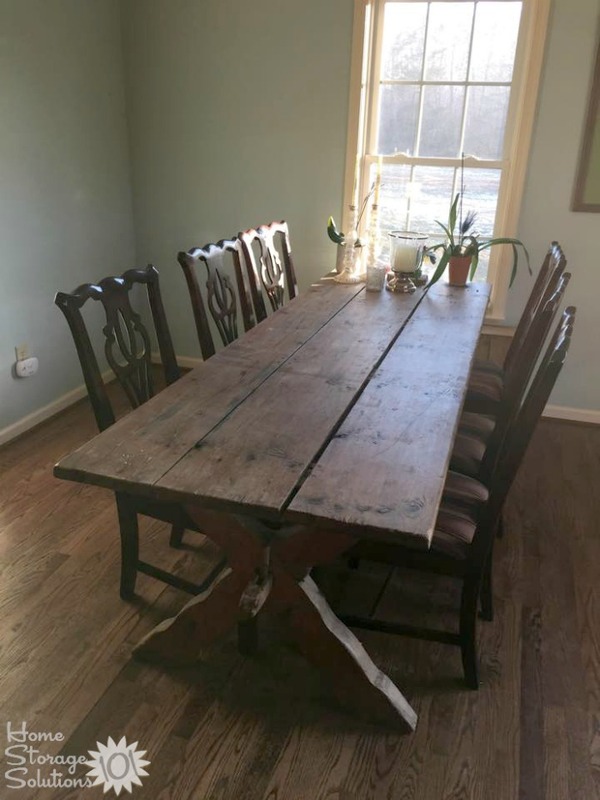 Jamie sent in the photo above, and she said, "With 6 children and 3 adults in this house I had to have a clean table or it drives me nuts. First thing to get cleaned after kids go to school is the kitchen. I would go crazy otherwise." In addition, above is a picture from another reader, Linda. She said, "Decluttered kitchen table. It has been this way for 3 days! So far so good!" Samantha sent in this photo, and she said, "Nothing better be left on my kitchen/dining table after homework, eating or just kicking it with friends. LOL. This is the Christmas time look of my table. Most times it is uncluttered like this." In addition, here's a photo from a reader, Gayla, who finished this mission. When The Kitchen Is Clean Everything Feels Better! Zoe sent in the photo above, and she said, "Here's my dining table. I keep a lazy Suzan on the table with healthy snacks for the kiddos to munch on whenever they want. It keeps them from digging around cupboards and the fridge. And the only mess is on the table - easy clean. When the kitchen is clean, everything feels (and smells) better!" Here's another photo from another reader, Lisa. Lisa said, "My before is embarrassing because we ran out of the house late this morning and the kids left their breakfast dishes but that's reality around here. Took about 15 min because I switched out Christmas decor in center with normal and got out the furniture polish, too. Feels good to finally do one mission successfully! Now to stay on top of it!" Tina from Dancing in The Fire shared her before and after pictures when she did this mission, both shown above. She said: "My pretty dining table. Somehow this and the bar have become our natural dumping grounds. I am working hard at finding organized alternatives!" Here's another before and after set of photos, sent in by a reader, Laurie. 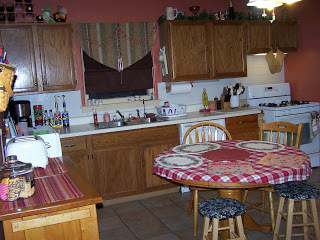 I hope seeing these pictures has inspired you to remove the clutter from your kitchen table, and clear it off. Plus, once you've done this easy mission make sure to send me your pictures here and I'll add some of the best ones to the page! I find I'm so much more relaxed and happier when the table is cleaned off. My kitchen table is like a rummage sale at the moment, loads of clean clothes that need folding up. Challenge accepted. This is my biggest pitfall ever in the house. A clean table DOES make a big difference, as does a clean sink. It changes one's mood. Love how it looks! Love how it makes me feel! Now, how do I get myself to make it a habit? I learned a while ago that I can't fold up on the kitchen table. Quite often I'll fold up but get distracted with all the other things I have to do and so it doesn't get put away straight away, or the older kids are slow in taking their pile of clothes. We get much more use out of the table now that I don't fold up on it. I tried so many things. Then I put a crochet with a lid and if you do not get your stuff out, I put it in a shoe box on the shelf. It is your responsibility to dig out your "stuff." I sure could use some suggestions on this one! My husband has gone back to college almost full-time, and he uses our dining room table (& floor too) for his "office" to study. If he only kept his laptop computer and a few books on the table I could live with that. However, he keeps his books, piles of papers (schoolwork), and more piles of papers all over the entire table (and then more stuff on the floor in the corner). We no longer use our dining room table for it's intended purpose, and I hate the mess. My husband does need a large table to work at, and that unfortunately means the dining room table. He won't clean off the table so that we can use it as a dining table, because he constantly needs it each day to study. He keeps telling me that in 7 more months we can go back to the dining room being the dining room (because that's when he'll graduate). In the meantime, any suggestions? This is a constant battle. My husband and I have 'FSS' aka 'Flat Surface Syndrome.' Basically, if something can be piled on it, there WILL be a pile on it. I got rid of all tables except the kitchen table in our house, so surprisingly, this is where everything gets piled. I'm going to work hard on this one because it makes me crazy! The lazy susan is a great idea! 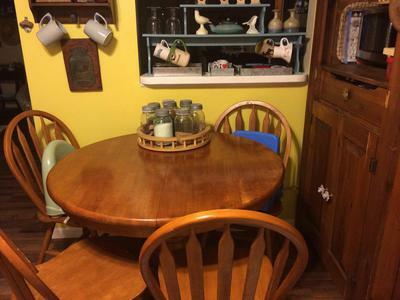 I LOVE the idea of a lazy susan on the kitchen table to keep the kids' snacks on. 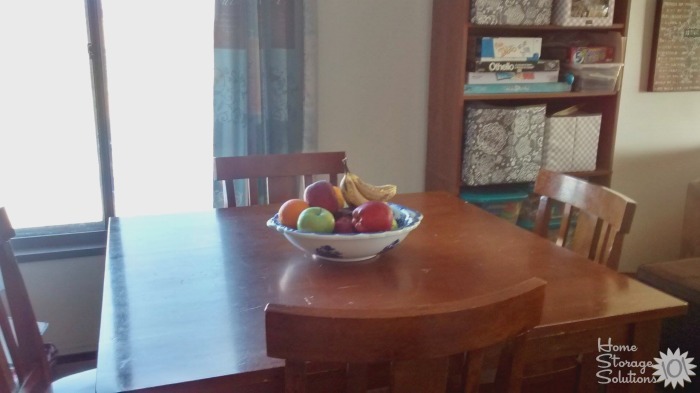 I always keep a bowl of fresh fruit on my table to encourage my kids to have fruit throughout the day, but the lazy susan would be great for other snacks like crackers, pretzels, veggie straws, etc. Thanks for the tip! 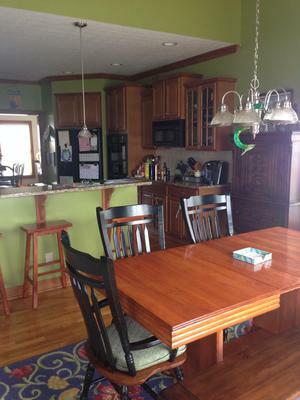 Our kitchen table and island are both clutter collectors, especially paper clutter. I can pick up after myself but what suggestions do you have for when the stuff belongs to someone else, e.g., Hubby? where to put the bills, mail? I love the idea of cleaning just before bedtime each night, but my kitchen island now becomes the cluttered space. Any suggestions on where to put the bills, mail, etc.? My kitchen table is piled high with paperwork. We have a dining room table that is clear, most of the time. Every day I'm trying to declutter a little. Appreciate your info. what to do with the table clutter? 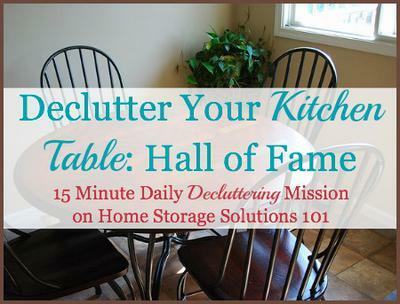 How do you make a home for the things that clutter the kitchen table? 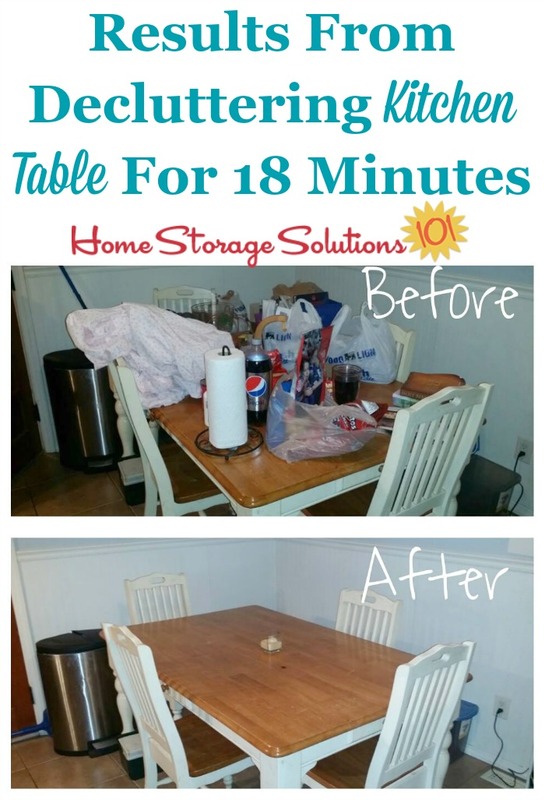 Ideas on where to put the stuff that accumulates on the table would be more helpful. Thanks. Hi Meena, it is difficult to say where to put the stuff, because each person's home is different, as is the stuff that is frequently put on the table. 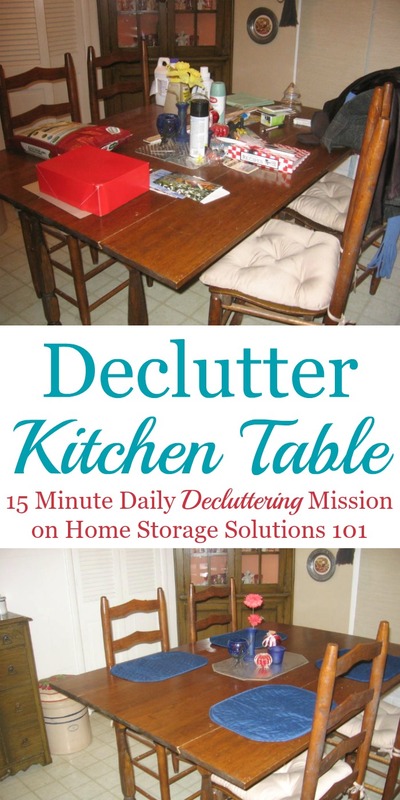 The whole purpose of the Declutter 365 missions is to declutter, slowly, all areas of your home so you'll have a space for everything important, and can put it in that rightful spot. Focus on whatever clutter you keep finding on your table and then find homes for items like that, even if that means you need to declutter another area of your home to make room. For example, if mail keeps getting piled on the table you need to focus on a spot to put incoming mail in your home that you will place it instead. You can check out the mail organization challenge for more suggestions on that. Feel free to search the site for whatever your problem area is for more ideas. To Anonymous whose husband uses the dining room table as his desk because he's back at school. How would it be if you accepted that for the next seven months, that area is his. He does need it after all, and I'm thinking his going back to school is for you and the whole family too? Not just to boost his ego? Perhaps you could find some other projects to work on, and as far as your hubby goes just concentrate on encouraging him and thanking him for how hard he is working for you. Let him know you believe in him; respect him for who he is and what he is doing for the family. Seven months truly will be here before you know it, especially if you can look at the positives and dump the negatives! We have no kitchen table (as) we eat @ the bar which connects to countertops. Boy is it handy to (toss stuff on) as we're passing by. I wonder if some of you could 'clean out' a drawer (that's near) the door people enter. And tell everyone to toss their stuff into that drawer. Yes - once a week or month or whenever, it will have to be cleaned out - - - but until then, make it be the clutter-catcher. Or if you don't have an available drawer - - - go to your local GoodWill & purchase a large decorative basket (and once again) tell everyone to toss their goodies into it (rather than) just upon the counter. Things always look visually cleaner if they're in a tray or basket or box. Because (stop & think) Where DO you put the article you cut out of the paper to give to a friend (or the) specialty light bulb that burnt out of your favorite lamp (or the) stuffed dog toy you intend on sewing back together? There's no way people can find/create a space for all of these unique things that everyone has. So I suggest the basket or drawer. Anyone else got-an-idea? My kitchen table is actually the only dining table in the house as I have a galley style kitchen. As a whole I am very organized and like things neat. However I have been ill and still keeping up with life is hard and I am tired most of the time. I know that when I walk in from work or errands, from the garage, my table is right there, so I put everything on it and take my coat off, I did put a coat rack on the wall but it is a very small space. Used to just hang my coat on a kitchen chair. So now I am looking at the space and I need to make it more functional. I am also handy, so I am going to build a shelving unit that fits the space, for shoes, boots, hats, scarfs and gloves. Along with that I need to make a place to set thing when I first walk in, as I also have a window sill there, as much as I don't want to take it away from the plants that live there, maybe I can find a compromise. Don't know how to post before or after pics, but my point is figure out how the stuff gets there in the first place, if it needs to be in the viscinity, rethink your space, add a shelving unit or baskets. As for the office issue, find another space somewhere in your home and create one there. I hope this helps any one who is asking how. I picked this off Pinterest to see if there is a magical secret. Found nothing that helps, just a lot of people asking what to do. So rethink your space and pay attention to what lands on the table and why. Where to put the clutter? There is always paperwork on the kitchen table...bills, mail, etc. 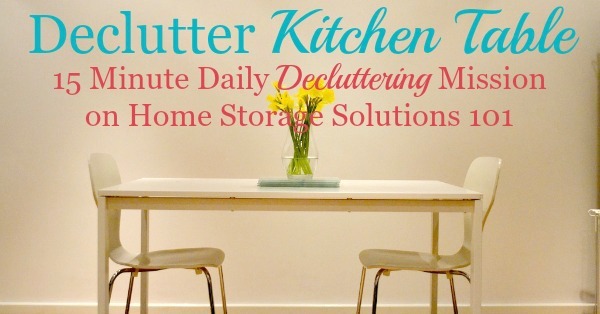 How do you keep the clutter off permanently and not just for a few hours? Depending on your house and size, here are a couple of suggestions. Yes, it's very important that he's going back to school, but 7 months is a long time to deal with the mess/inconvenience. When my husband went back to school, we bought an inexpensive student desk, & stuck it in a corner of the living room. I made a skirt for the desk (attached it with velcro), that matched my decor, of course :-). This was his designated area, & it actually gave him more privacy than being right in/near the kitchen. Perhaps you have an old table or desk that you can use, or search craig's list for something cheap. An old, small kitchen table works great. The skirt helped give an area to "hide/store" some of the stuff (and all the cords) when not in use. I got him one of those portable file holders, & he was able to "file" papers, documents, even spare legal pads. Milk type crates worked well for all the books- he was even able to stand the books up in the bins so he could read the spines(titles) & easily pull out what he needed & put them away when he was done studying. He wasn't perfect about putting away when he was done, but it was a good enough system that when he wasn't studying, I could tidy up better & he still knew where to find everything. All the bins and crates (dollar stores are a great place to find cheap ones - it doesn't matter if they are pretty, because you're going to hide them under the skirt when not in use) got slid under the skirt at the end of the studying session. Then the desk "area" seemed to have a purpose & made sense. If you have a spare corner in a den, living room, dining room, spare spot in a guest room, or even turn a closet into a make shift work area (there are tons of pins for this on pinterest), ANY designated spot that you can put his desk will get him off the kitchen table & save your sanity. Hope this helps... it worked for me & I was shocked at how he actually attempted to tidy up when he was done studying. He said it actually made it nice to study in a designated, somewhat organized spot :-). We have a peninsula instead of an island or table. Area is where everything gets plopped down, and my husband just leaves his stuff. So, I bought 2 matching rectangular baskets that fit against the wall. I put things in the appropriate basket. Every few days they get emptied. Works pretty well. The lazy susan snack idea is great. Thanks for sharing. It might help for him to have an open storage box or bin to put his papers and books in, in a "stand-up" filing style with colored folders or file pockets for his different categories. The books would stand up also so that nothing lays down and gets buried. 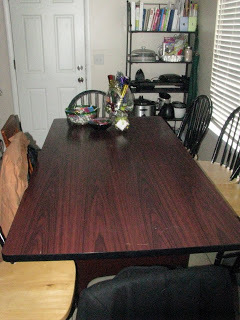 Having six children I had to find a way to not only keep the clutter off of the table but to be easily put away. I placed a 6 drawer dresser in the kitchen. Each child is assigned a drawer. They learned to put their belongings in their drawer rather than lay them on the table. If they are missing something they know to look there before asking me as I put things in their drawer when I'm tidying the house. Once a week they take their drawer to their room and empty it putting all of their things into their proper place. It has been a life saver! Years ago as the mother of 3 children in 3 different schools and school districts I was desperate to find a system that kept clutter to a minimum. I also needed to be able to find the appropriate papers for that childs school and activities. When I had our new house built I wanted a pantry that would allow me to put a 2 drawer file cabinet in it. So I have a waste paper basket on one side and the short file cabinet on the other side. We do not have a study. This has worked perfectly for me for 30 years. The file cabinet is still there and the kids are gone. But each file holds things that would have ended up spread around the kitchen in different piles. Today I have files for each of our medical bills, home maintenance, misc. important information, recipe clippings etc. With kids it was essential for keeping their schedule straight, now it is just a good system for clearing clutter off the counters. In a vase and a napkin holder next to it. As well as a medium red box for our families daily sketches. Where do I put the stuff? If I have a small house and a lot of the things on the kitchen table are used everyday, where do I put the stuff? I tried but I can't seem to get anything completed today, can't even concentrate on the TV. I worked thru 2 sets of commercials and had to quit from exhaustion when I looked at stuff, like bubble wrap from a parcel, and couldn't decide whether or not to keep it. Feels like a lot of pressure, going to go back at it tomorrow. No dishes or paperwork on it, just stuff that has come in recently and has no home. I do sometimes clear off the kitchen table and shift things to the dining room table. But the dining room also functions as my home office - don't have any other space for this right now. I moved and still had not downsized my kitchen. On my table was 24 boxes, the chairs held 6 more. Many are gone, only 4 remain. I'm writing this today because 4 sets of dishes, two boxes of mugs and water bottles, boxes of pots and 3 boxes of pans have made their way to my car and to Goodwill. This was huge for me as I thought the items were overstock from the larger home, but they were from my brother, ex, mom and grandmother who have passed. I took pictures and kept a couple of pieces for the china cupboards. Now I need to deal with the last few, but I'll work on those when we get to their topics. This was emotionally tough. I am glad it has been completed! I have taken to scanning most of the papers around us - simple desktop scanners are cheap, a combined print-scan-fax-thing might even be more useful. For all those "I would like to do this/show somebody" (like theater, book recommendations, trips,...) I scan and forward or put in an adequate folder. OneNote for Windows is an option to administrate (e.g. I have a "gift" sheet to collect those scans. I also scan all "important" paperwork like bills, insurances, banking etc. -> scan, set up when to pay this with internet banking e.g., note down the paid date on the paper, put away in folder. Ever had that that you need to phone your insurance or bank and they go "hm, send me the paper whenever you have the time" and you ask for that person's email and send it directly? Great. Important files are accessible for hubby and me or for my parents and me (emergency stuff). What I still have an issue with is where to keep medication...if it is on the table, I remember. But it does not look very inviting... I try now to remember with Habitica.com and keep all in a nice box. Let's see. Other ideas where: in cabinet where tootbrush is, next to bed (did not work), next to smartphone,...?! Any ideas? I need some meds morning and evening, before/after meal does not matter. I have a bin that actually is like a small sink tub to keep my meds in. It's not that pretty but does the job. Since I take many meds I use a med planner too so they're both on the table to the side. I live alone so this is not a problem. I may get a prettier bin to put them in when I can afford it but this has worked fine for the 8 months since I moved here. An affordable alternative would be to use contact paper on a box. I use my dining room table as a workspace for lesson planning and tutoring, and what has worked well for me is having a small bookcase nearby to store all my books and papers. If you have the space in your dining room, setting up a small bookcase would give you a place to store all your husband’s school things when you’re using the table. Another suggestion is to compromise and only eat at the dining room table certain nights. This way, he wouldn’t have to clear his school things EVERY DAY, and you wouldn’t have to wait 7 months to eat at the dining room table.